Many people can take a number of different medications at different times of day. We understand how confusing this can be and in our pharmacies we can help make this easier! This service is offered free of charge and can be a helpful way to help manage your medicines. 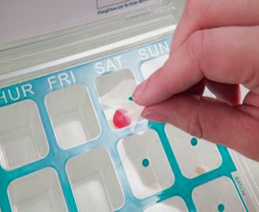 We can prepare prescriptions into a weekly 'compliance tray', also known as a 'blister pack'. Each blister pack has a row for each day of the week and a column for breakfast time, lunch time, dinner time and bed time. All you need to do is pop out the blister for the right time of that day of the week and take your medication. Please contact our pharmacy if you feel this service would be suitable for you or your relative.